The Sitemap Pro plugin is advanced version of popular Image Sitemap pro plugin. Customers wanted a single plugin to cater sitemap needs of their website. They did not want to use two Sitemap plugins. This lead to creation of the plugin. You can download the plugin and get the License key from Purchase receipt or Account area of yours. In case you are new to WordPress plugin installation read this article. 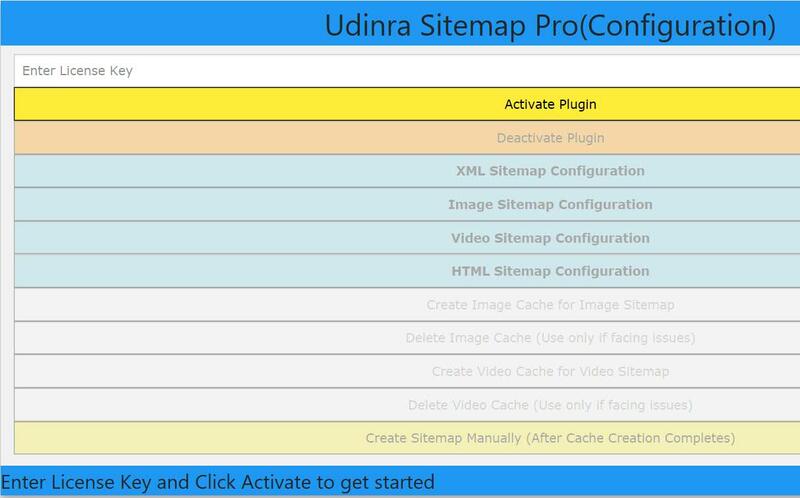 After installing the plugin you can see plugin configuration page on Settings-> Udinra Sitemap Pro. Activate the plugin first. After you activate the plugin you can see all the configuration options. We have put in lots of thought to minimize number of configuration options and keep it simple. All the options are self explanatory but I am providing more details here in case you need. It is recommended to use either Category or Tag Sitemap not both in most cases. If you have clear distinction between list of posts under each category and tag then only select both the options. On single author sites there is no need to create author sitemaps. On multi-author sites you can create Author sitemaps. You should also include post types you want indexed. By default post and pages are only selected. In case you do not want Google to index any page or post then you can enter the ID of that post or page. You can enter multiple ID’s separated by commas. How frequently sitemap should be generated? There are three options currently. This option is best for large sites with too many images. Also if you see delay in Image Sitemap creation while publishing a post or page then select this option. If you select this option then sitemap is generated as soon as page or post is published. So if any content is changed on your site sitemap is refreshed. This helps you have latest sitemap at every moment of time. Ideal for small sites with less content. It is not recommended for large sites. If you select this option then sitemap is created daily as well as when a post or page is changed. If you have less frequently changed site then this option can be used. These options help in creating Image Sitemap for your site. It is recommended to select these options.All websites should use Image sitemaps. If you do not use any special plugins then also select the appropriate options and Save the options. If you are not using any one of above plugins then select None. If you are using any other or none then select None option. It should work with others as well. But was not extensively tested. If you are using Visual Composer plugin then select this option. The plugin supports some other plugins which does not fall under any one of above category. It supports Download Monitor plugin. So if you are using Download Monitor plugin then you should select the plugin from this option. In the text box you can enter your CDN name. Many websites use CDN (Content Delivery Network) to improve their website image load time. In case you are using CDN for your images you can enter the name here. For example if your CDN image URL is static.your-domain.com/image-name then you need to enter static here. The plugin creates Cache for faster sitemap creation. The cache creation is one time activity. After that plugin takes care of everything. By default 1,000 URL are indexed together to create Image Cache. For most websites this should be fine. But in case you get any blank screen or time out issues then you can decrease the number here. Note the plugin will behave fine even if you face any blank screen issue. You should create Video Sitemap if you are using Videos on your website. You can select video configuration options here. Are you using YouTube videos? If you have YouTube videos on your site select Yes else No. Are you using Vimeo videos? If you have Vimeo videos on your site select Yes else No. Are you using Dailymotion videos? If you have Dailymotion videos on your site select Yes else No. Are you using Woo Commerce videos? If you have Woo Commerce (YouTube) videos on your site select Yes else No.Note on Woo Commerce Videos are used using YITH Woo Commerce videos plugin. The sitemap supports this plugin and YouTube as the provider. By default 50 videos are used to create cache at one go. For some sites this may work fine and for some this may create issue. In case you face any problem you can lower the limit of videos on your site. The HTML Sitemap options are same as Web Sitemap options. There is no difference. You can select the options and Save them. Image Sitemap – Why you should start using one? Have you disabled WordPress remote publishing? How facebook forces you to enter your mobile number? How to solve blank Google Adsense ad unit issue? How to choose perfect WordPress permalink? How to measure site performance in different Google property? Clicksor review Google Adsense alternative? PulsePoint review Should you use this CPM network ? Humans.txt file Should you use it on your website ? How to get your copyrighted documents removed from Scribd? How to make money with Hindi blogs? How to create your first mobile app with Intel XDK? How to add Cordova plugin to Intel XDK? How to add Rate this App in Intel XDK? How to remove rel=”noopener noreferrer” from WordPress? is generated. You should create a page Sitemap and paste the shortcode there. If you browse the page you can see the HTML sitemap generated. This is recommended before creating the Sitemap. The plugin scans your website and creates the cache. This is one time activity. The cache gets updated with time automatically. Note you may have to click the buttons more than once if you have too many images/videos on your site.You will get appropriate message if you have to click the button again or not. This may not be required but in case something is wrong then you can delete the caches and recreate them. Most of the times your issues will get resolved. After click on Create Sitemap button your image sitemap file is created.The main sitemap file is index sitemap file (your-domain.com/sitemap-index-image.xml). You should add this sitemap to Google Search Console or any other Webmaster sites like Bing Webmasters. Submitting sitemap to Google is one time activity. The sitemap gets created automatically and is pinged.